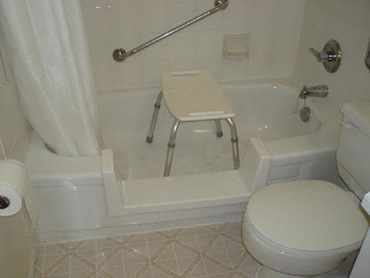 Tub to shower conversions can be confusing. Take a moment to browse through our frequently asked bathtub conversion questions. Still can't find the answer to your bathtub conversion questions? Contact us now! How much does a tub conversion (tub cut) cost? How long does the tub cutting and installation take? Is the tub cutting process messy? What colours do the new threshold come in? How much can I expect the step to be reduced by the tub conversion? How is the water prevented from splashing onto the bathroom floor after my tub conversion? What is the warranty on bathtub conversions (tub cuts)? Bathway's tub conversion (tub cut) costs $895 for steel and fiberglass tubs and $1195 for cast iron. If your house was built prior to WWII you may have a cast iron tub. For more information check our product list. The installation process takes just over an hour with a minimum of disruption. Tub cutting for cast iron tubs takes a little longer. Not at all! Our installers clean as they go so it leaves no mess or dust as they easily convert your tub to a shower. Any colour you want as long as it's white. It's in fact slightly off white, designed to match most white bathtubs. Our standard threshold allows us to reduce the step by 8" for most tub conversions. A standard tub is 14" or 15", leaving a step of 6" or 7". We also manufacture a deeper threshold that can be used for deeper soaker tubs. This allows us to reduce the step by 11". A regular shower curtain does the trick. Your installer may need to lower the curtain rod to ensure it hangs below the opening, but we'll take care of that. There is a three (3) year warranty on all tub cuts, conversions, parts and labour. "I was scheduled for hip surgery and one of my concerns was how I was going to get into the bathtub. I didn't have the time and money for a bathroom renovation, so my therapist referred me to Bathway. I don't know what I would have done without them."